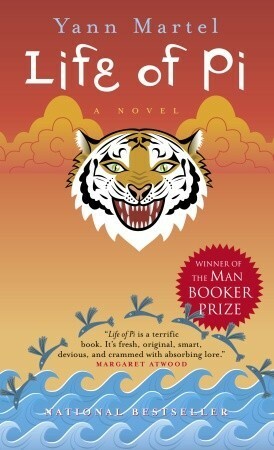 ‘Life Of Pi’ is an adventurous novel written by author Yann Martel that has sold more than ten million copies worldwide. This fascinating story follows an Indian boy called Piscine Molitor “Pi” Patel. The beginning of the story explores his childhood and youth. From the early age Pi stays close to wild animals as his family owns a zoo. His father notices that Pi is too naive about tigers and decides to show him how dangerous they can be. He forces the children to watch the tiger cruelly killing and eating a goat.Being a teenager, Pi has to go by ship with a lot of wild animals on board as his family decides to move to Canada and sell all the animals. When the ship encounters the horrific storm , Pi manages to escape: he is tossed overboard and into a lifeboat. What happens to him next will definitely shock you! He finds himself on the same boat with hyena, zebra and orangutan named Orange Juice in the heart of the Pacific Ocean. Later Pi realizes that there is also a huge Bengal tiger which is hiding beneath the canvas. After the hyena eats zebra and orangutan, and the tiger eats hyena, only Pi and Richard Parker (the name of the tiger) survive on the lifeboat. And this is the beginning of a long and tough adventure! You will completely fall in love with the awesome main character, Pi, because he is so clever, brave and kindhearted. He has to go through many trials of life that make him strong and develop his abilities. He never gives up and never ceases to believe in himself. Pi is a real role model for many people. This is an incredible storyline you’ve never seen before. There is no real difference between fantasy and reality and that’s great! ‘Life of Pi’ is highly recommended for those who like fiction stories about life and life values which has a lot to think about.